Okay, so I am a HUGE fan of the combination of sweet and salty. 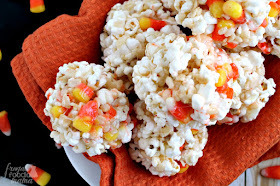 I came up with the idea for my Candy Corn Popcorn Krispie Balls one day while I was eating popcorn and at the same time popping in a handful of candy corn here and there. 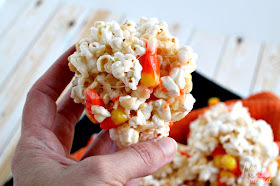 I started thinking, how fun would it be to make a popcorn ball with candy corn in it? If you want to up the sweet & salty factor even more in these addictive popcorn balls, use microwave kettle corn in this recipe. 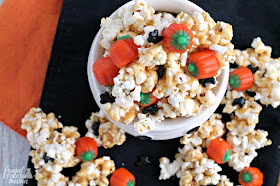 I did when making them again for these updated photos & loved how the flavor turned out when using the kettle corn instead. Pop your popcorn using your method of preference. In a dutch oven, melt together the butter, corn syrup, and salt over medium heat. Once melted, add in the mini marshmallows. Stir until the marshmallows are completely melted. 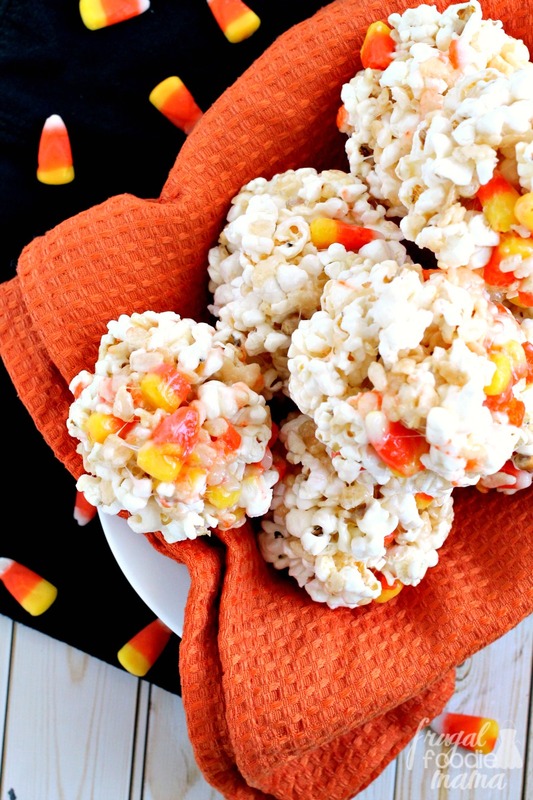 Remove the marshmallow mixture from the heat, and mix in the popped popcorn and rice krispies. Quickly fold in the candy corn. Allow the mixture to cool slightly, until you are able to safely handle it. When cooled enough, spray your hands with nonstick cooking spray. Grab a large handful of the popcorn mixture and form it into a ball. Place on a sheet of waxed paper or parchment paper. Continue this same process until you have used up all of mixture. You may need to spray your hands one or two more times during the process. Allow the popcorn balls to cool completely and then store in an airtight container for up to 5 days. How cute are these? 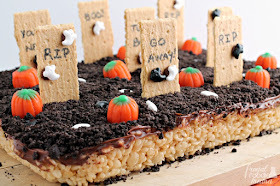 And perfect for a Halloween party too! 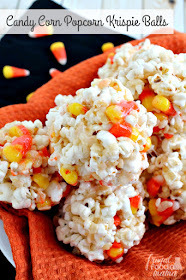 I love candy corns and I have been on a rice krispies treat kick. Sounds delish! Yum! Yum! This looks delicious! I just got a bag of candy corn so I'll have to try it out! oh wow!! I just love everything about this recipe. i am so making it. thank you!! These look absolutely amazing! I cannot wait to try this recipe; thanks for posting! Yum, this looks really good. What a fun and different Halloween treat! These look great! And I'm not even a fan of candy corn...but I'd try them! OMG~these look amazing! I have been compiling a list of Halloween treats to send to my son and his roommates at college. These have to be on it! They will love them! !Great recipe! So sweet and festive! Thanks for coming to party with us at Whimsy Wednesday! Oh my gosh I need this in my life right now!! YUM! And your picture is awesome! New follower from the link party! Would love for you to visit me and join my site as well!